In layman’s words, Arthritis means joint inflammation. Early diagnosis and right management of the condition can help people with arthritis live a healthy and active lifestyle. The common symptoms of Arthritis involve the joints and they include pain, stiffness, redness, and swelling. To manage their arthritis better and to get relief from pain and swelling, many people are adding natural remedies such as herbs, essentials oils, and healing baths to their treatment plan. Here’s a rundown of 7 herbs that have been found to help people with Arthritis manage the condition better. Including these herbs& spices in your treatment plan is a step towards managing Arthritis in a natural way. However, it is important to consult your doctor before taking any of these herbs. Leaves of Aloe vera contain a gel-like substance containing vitamins, minerals, amino acids and antioxidants. Though Aloe verais popularly known for treating shaving cuts, bruises, and other skin abrasions, the herb can also be used topically to soothe aching joints. Eucalyptus oil has been used since ages for body massage. Its anti-inflammatory properties help soothe the inflammation and pain associated with Arthritis. It’s one of the most common herbal treatments for arthritis. Turmeric, known for its healing properties, contains Curcumin, a chemical with powerful anti-inflammatory and antioxidant properties. 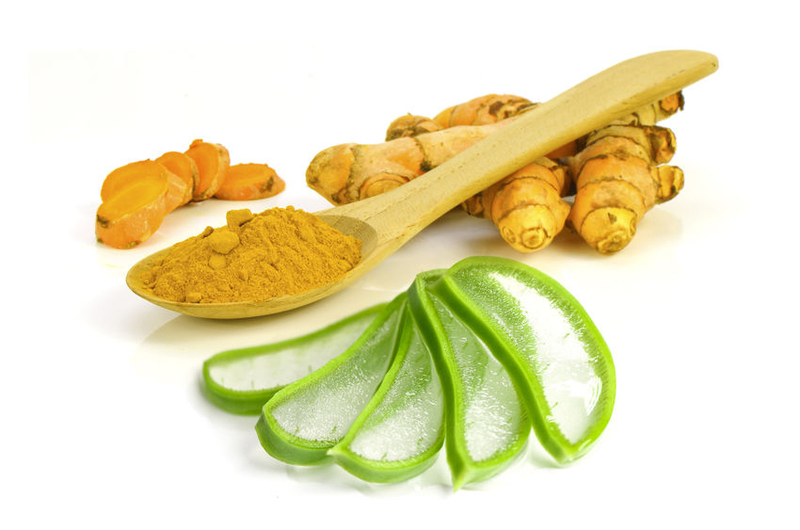 It is Curcumin that makes turmeric an effective agent for reducing joint pain and swelling. In a small study conducted in 2012, a group of patients with rheumatoid arthritis were given 500 mg of Curcumin, while a second group of patients was given 50 mg of an anti-inflammatory drug. A third group was given both Curcumin and the drug. Though all the groups experienced an improvement in their conditions; but the group that received only Curcumin was found to have the most improvement. Just like Turmeric, boswellia is known for its anti-inflammatory properties and is used commonly in Indian medicine. Boswellic acids, a chemical compound found in the gummy extract of Boswellia, can prevent the formation of leukotrienes, biochemical substances that cause free radical damage to healthy joints. A study published in the journal Phytomedicine found that patients with OA knee pain who received Boswellia experienced a decrease in knee pain. Known for its exceptional anti-inflammatory and antioxidant properties, Dry Ginger helps reduce joint pain and swelling. A study of 247 participants with Osteoarthritis of knee found that patients who were given ginger capsules twice a day for 6 months experienced a significant reduction in pain than a control group. This is a 100% Ayurvedic product and doesn’t have any side effects.